Mom’s life is moment to moment. Literally. Her short term memory is very nearly gone. She doesn’t remember any events of her life, she can’t make sense out of her surroundings, she can’t repeat what she just said or hold in her consciousness anything that anyone else has just said or done. Even the simplest tasks elude her. I often bring food for her to snack on. She long ago lost the ability to take the food from my hand. It was as if she couldn’t focus on what part of the thing in front of her she was supposed to grasp. She often grabbed 6 to 8 inches in front of my hand to take what I was offering, or she’d grab my finger instead of what I was holding. It’s not her eyesight. It’s the Alzheimer’s scrambling her brain so she can’t make sense of what she is seeing. So, I started putting whatever I brought for her to eat in her hand. A cold, wet grape. A big, fat strawberry. She could find it in her hand and eat it. Now she is having trouble taking something out of her own hand. She’ll try to pick up her own finger. I can see the gears turning, “No, that’s not it.” Sometimes she’ll try to pick up something that isn’t there, at a spot close to where the item is that I’ve placed in her hand. She’ll bring her fingers to her mouth and “taste” it, and say “mmm, delicious” but all she’s picked up is air. Now I place the food against her index finger and watch her thumb move over to hold it in place. I sometimes have to tap it against her index finger before she’ll take it. I feel like an operating room nurse, slapping the surgical instruments into the doctor’s hand. My job is to fill as many moments in Mom’s life as I can. We cuddle, and sing, I wash her hands and brush her teeth, I bring food to eat, we listen to music and play with the dog. We wind yarn, and I give her hand and foot messages. I tell her how much I love her, and we make moments together. I try to come every day that I’m not on the road teaching because the thought of her alone in her own head breaks my heart. If it was a choice of “nothingness” or “happiness” that would be sad enough. But Mom seems to have random thoughts that frighten her. Perhaps they are dreams, or they are fleeting fragments of memories from long ago, or she has simply heard something one of the other residents or staff has said and misunderstood it. She has relived the death of her own parents many times, has truly believed someone was trying to hurt her or take something from her, and she is remorseful for something she has done “wrong.” It’s hard to know what triggers these emotions, but her sorrow, fear, and anger are real. And she acts on them. That is the only explanation I have for her uncontrollable crying, cursing at the top of her lungs, or crashing her walker into people and furniture. I am always looking for good moments to give her. 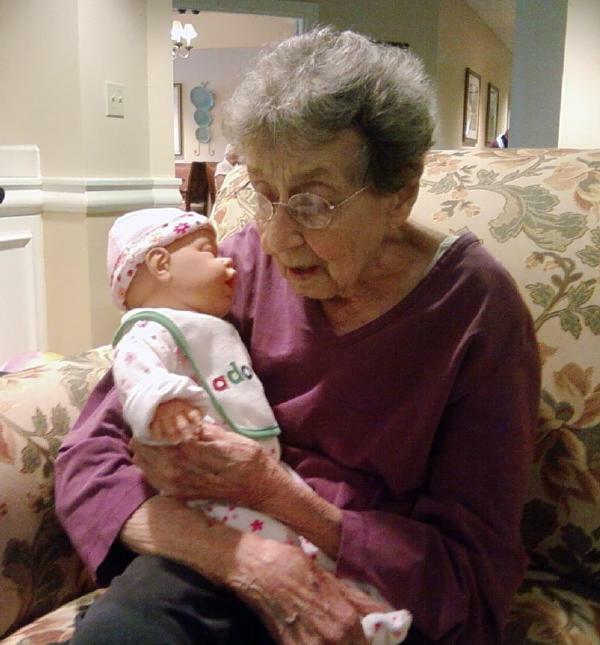 The other day one of the other residents left her baby doll on the sofa in the common area and I sat Mom down there and asked if she wanted to hold the baby. She demurred. The last time I suggested it (several months ago) she quipped, “Why the H would I want to play with a GD DOLL! ?” This time I think she thought it was real and she might do something wrong. I told her it was OK, maybe she could show me how to rock the baby. She picked up the life-sized doll but didn’t look like she knew what to do. I suggested burping the baby and she carefully placed it on her shoulder and patted its back. Like a pro. With a little more coaching she found the part of her brain that remembered how she had held and rocked and burped me some 50+ years ago. It was an amazing moment. About that time I had to talk to one of the supervisors and left Mom with the doll. When I came back some 10 minutes later she was still holding it, talking to it, and tapping her hands in time to the music that was playing. I can’t tell you what joy that moment brought to me. You have to find the moments when and where you can. And sometimes you have to look pretty hard. My kitties are watching me and wondering why I’m crying. My heart is breaking at the thought of what your family is enduring, but happy that there is still the ability to search for and find a moment that is able to bring a little bit of pleasure into what is undoubtedly a very painful situation. Your family, and others dealing with Alzheimers, are often in my thoughts and prayers. When you post these tender, heart-breaking moments, you take me right back to the last couple years with my mom. Hang on to the good times that flash – they come so seldom. Blessings to you and your mom as you travel this long, unpredictable road. Thank you for that touching story. I went through a time with my Dad that was similar to what you described in some ways. How nice to have the photo to remind you of that peaceful moment. Tears in my eyes. . . for those small moments of minute happiness you are receiving. . .
you and your mother are in my prayers. . .
Ami, those “now moments,” while rare, are so precious. I know you savor them. My best friend no longer knows me and can’t figure out why I bother her by calling. On occasion however, she does “connect” for a fleeting moment and it feels so good. Bless you, your mother and your family. God cares about you all and so do we. Ami, this is so heartbreaking and so sweet at the same time! It is like the long, slow demise of a beautiful life. There are so many folks with this disease that have no one to take the care and time that you do, and I commend you for that. Even with a busy life, you find time to do what is important. Blessings on you! Thank you for sharing these moments with us. Your gift for words brings tears to my eyes and fills my heart with emotion. I rejoice in your joy in the midst of your pain. Thank you for sharing even how you work with your mom to continually stimulate whatever she can find and use. Those moments are a treasure. Blessings to you for being a blessing to your mom and us. Ami, It took me three tries to get through this and read it I kept crying, it is so emotional, sad, and also wonderful.. I thought when i saw your mom saying I love you a while back was a beautiful thing. When all this is said and done these are the moments you can sit and remember. My thoughts a prayers are with you. Ami – as painful as this journey is, I’m glad you’re sharing it with us, if for no other reason than to remind us to live EVERY moment fully (even through the tears). My grandmother also had Alzheimer’s – each day brought it’s own set of challenges, but often joys too – many days the challenges proved to be almost too difficult to deal with, but with God’s grace we made it. She died when I was expecting my first child, a bit of news that I never got to share with her (I was named after her). I’m thankful for the good memories, and look forward to seeing her “whole” again someday! Ami, your blog today brought back so many, many memories of my father’s journey through dementia/Allzheimer’s. My entry will be way too long, but I guess this is as much for my benefit as it is for yours. I experienced the same issues with Dad’s holding of food, trying to take bites, and even having to be told to chew and swallow what was put to his lips and mouth. Alzheimer’s is probably the hardest road you will ever have to travel, and there may be additonal issues yet to come that will tear at your heart more than anything up to this point. I think my father’s silence during his last few months on this earth were the worst. It was so difficult to give up hearing his wisdom that he shared when asked or his enjoyment of telling me a good joke or hearing him raise his lovely baritone voice in singing some favorite song. You need people praying for you. God can sustain you and give you the strength to shoulder the load you must bear as a loving and caring daughter. Count me among those who will be asking God’s divine blessing and care and comfort to surround your mom, her care givers, and you – her family. Just know how much love is coming your way from all of us. God has a plan, we just don’t know what it is yet! Maybe he just wants us all to quilt a little more and enjoy life more! AAQI is helping, your a doll ~ keep your chin up (my grandmother’s saying). I’m praying for you and your wonderful mom! Thanks for helping us all to look for (and find) the gold in every moment. My mother is caring for my father who is suffering from senile dementia. We all struggle with finding the good moments in this continuing downward spiral. Thanks again. Please accept my cyber hug – I know how difficult todays blog must have been to write. I sincerly hope that by sharing your thoughts with us, it is helping you to deal with your pain. Ami. I treasure your report being as how I and my family are in the middle ?? of this same thing with husband Al. Your ability to write your thoughts and love for your mother are inspiring. I keep a journal and I think it helps. We have been in KY all summer and Vickie has been here every other weekend. Thank goodness for her and husband Ken to give me a bit of respite. Dear Ami, God has blessed you with such a special mother and her with a very special, caring daughter. Life can be so difficult at times, but you will have many beautiful memories when she is called Home one day. Blessings to you all. That picture of your mom is precious. A fleeting moment, but real. I always think of this quote when a loved one is losing touch…. It is very special that you are there making sure she continues to feel loved. I know how heartbreaking and rewarding that can be. My mother suffered from dementia. We took care of her at home for four years.She went into the nursing home after breaking her hip because she could not relearn to walk. She lived there another three years, dying eight days shy of her 84th birthday and seven weeks after my 49 year old husband died suddenly from a heart attack. I am crying as I write this, feeling awe at your and your mother’s strength to persevere with what life has given us. I send both of you giant hugs. warm wishes, and loving smiles. Thank you for sharing this with all of us who care about you. Your mother raised a wonderful daughter! That’s a fine legacy and great accomplishment from Beebe. Thank you for sharing experiences that must be so painful, and for being such a wonderful daughter. I am in tears. My great aunt, my uncle and my sister’s mother-in-law all suffered from some form of senile dementia. It is heartbreaking and frightening to see someone so vital suddenly forget so many things. It is time to find a cure. And, when she forgets how to chew–stroking her cheek may help. And, when she forgets how to swallow–stroking her throat may help. Altho she may have only liked “black” coffee–adding cream & sugar will give her more calories. Thank you for sharing your story of being with your mom. I went through the same thing with my mom. How I wished I had you to help guide me. Just know, that I will be praying for you and your mom. Ami. I share your feelings. I lost my dear husband to this horrible disease just one year ago. Just two weeks before his death he remembered for about 5 minutes that I was his wife and told me how much he loved me with a hug and a kiss. That is my most precious memory. Ami, you are my HERO. What you are doing for your Mother is nothing short of heroism. Seriously. So many seniors are left on their own in institutions with nothing but strings of sad days ahead of them. No one visits or seems to care. I love what you are doing but know that it is probably the most difficult thing you have ever done …. and yet you keep going. As one of the other posts mentioned, I will say prayers for you and your Mother also. You are living through difficult times and will need all the strength and, maybe even more so, all the levity you can muster. Sometimes the only thing that can get us through hardships is humor. Good luck and God Bless. Ami…with tears in my eyes I write this to you to tell you that you are one amazingly wonderful daughter. You will have no regrets and I know your Mother can feel the love you pour forth into her every being. Thanks for sharing these very tender moments with all of us. I hold you in prayer and ask God to give you the strength you need day by day. I am not a quilter, but I have a good friend who is,she sent me your your most recent blog about your Mom. I want to thank you so much for putting into words what I could not. I am watching as this awful disease takes away my Dad. I too look for those little moments when all the “piecesfit together like a one of kind quilt.” I am learning to let him live in his own world, your words helped me more than you will ever know. I know what you are talking about. We watches our Mom go throught the same feelings. I believe it was harder on her than on us. She would remember something,but it was gone just that fast and then she would cry because she knew she could not remember. Ounce she got to the point where she did not know any of us it was easier on her. My Mom has been gone for 14 years she is in a better place. Tears. Lots of tears. Hugs to you both. What a lovely moment, with a photo worth a million dollars. Treasure the moment. I am a nursing home chaplain. Everyday the staff do their best to love our residents. I have forwarded this piece to many of them, encouraging them to read it to see what the Alzheimer’s experience feels like to a family member. God’s love, grace and peace to you and your family – and to all who face this disease. Thank God you can find the moments and appreciate them. You are an extraordinary woman and I think that your mom must have had something to do with that! I am so grateful my mom didn’t suffer from Alzheimers and that I didn’t have to go through all this. But at the same time, I was so yearning for a few moments with Mom again. Even if all I could have done was watch a fuzzy memory of her instinctive mothering from long ago. Am I jealous – surely not! But, your story called up all the primal connections I felt with my mom & feel with my daughter now as I watch her with her baby. I lost Mom 6 years ago and I would give anything to have just another 5 minutes…….. The thing that amazes me, Ami, is the tenaciousness with which you search out and find those moments…like tapping her index finger to trigger the automatic response of grasping with her thumb. Then you had the unexpected joy of watching her ‘cuddle the baby’…coming back just in time to experience it! What a precious, precious memory of your mom! Thank you for sharing it with us. Before he died, Daddy sang to mom, and afterwards I did, too. We kept a small hymnal and a tape (that they had made many years ago of her playing the piano) in her room; I’d put the tape in and sing a few hymns. Once, she tried to sing along. Even though those “bright” moments are few and far between now, each one is even more meaningful and precious than the last. I’m sure you were glad you had your camera with you. You are a good daughter, Ami. Ami – I’ve read the last comment about your Mom holding the baby several times and it always brings tears to my eyes. I can’t tell you how bad I feel for you both. I just can’t imagine what it must be like for you. I think of you often and pray for you and your family. Thank you for sharing your struggle with all of us. I admire you very much as a quilter, but even more as a person. Your mother is exceptionally lucky to have you. I have put your Mom’s picture with the baby doll on my desktop so I can look at it every day. Such a special moment! I lost my own mother this way and now my aunt is “experiencing” this same ending. There are no more words for this.